The results of the final two races of the 2018 Pirelli World Challenge season at Watkins Glen International would determine champions in three classes. 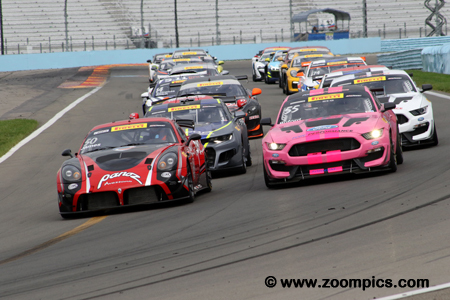 The SprintX titles were decided at the Utah Motorsports Campus but still ‘up for grabs’ were the GTS Sprint, GTSA Sprint and overall GTS champions. 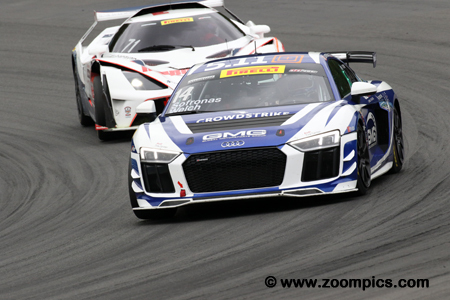 GTS drivers would compete in two fifty-minute races around the eleven-turn 3.4-mile road course. 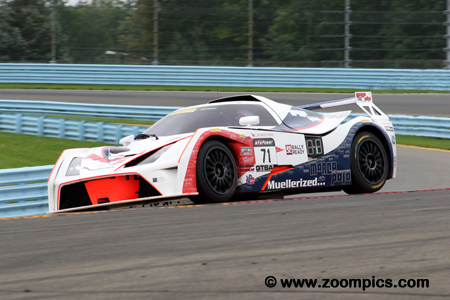 The event titled, The Grand Prix of Watkins Glen was presented by TM Performance. The pace lap for the penultimate round of the 2018 Pirelli World Challenge GTS class. Leading the field through corner eleven is the pole-sitter, Ian James driving the Team Panoz Racing Panoz Avezzano GT4. Sharing the front row is Jade Buford in the No. 55 PF Racing Ford Mustang GT4. Behind the leaders are the former GTS champion, Lawson Aschenbach and Patrick Gallagher filling in for an injured Vinnie Allegretta. 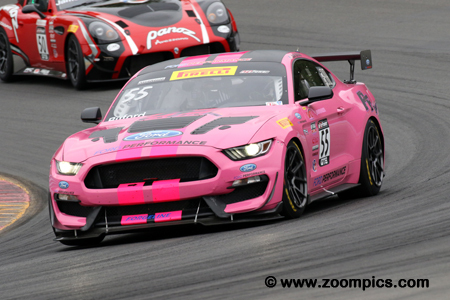 Entering the final two rounds, Jade Bufford driving the PF Racing Ford Mustang GT4 was third in the GTS Sprint category and fourth in the overall standings. His mission was to win both races and score maximum points. During qualifying, Buford was second quickest but took the round seven race lead on the first lap and won by a margin of 0.208-seconds. Unable to make the same pass in the season’s finale, he finished second. Jeff Courtney competed in the GTSA category and only participated in the Sprint events. The driver of the JCR Motorsports Maserati Grand Turismo MC GT4 qualified seventh overall and first in his group for race one. Later that afternoon, Courtney scored his second class victory of the season. On Sunday, he started first in his category and took the runner-up position which was enough to secure the GTSA Sprint title. 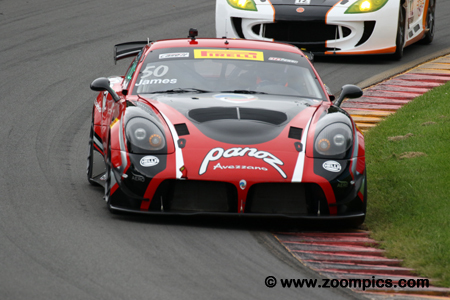 In the first half of the season, Ian James driving for Team Panoz Racing didn’t score many points which could be attributed to mechanical failures and technical violations. But the team’s fortunes turned around at Road America. At Watkins Glen, James grabbed the pole for the weekend’s first contest. Unable to hold off Jade Buford in race one, he finished second. On Sunday, James led flag-to-flag for his fifth win of 2018. 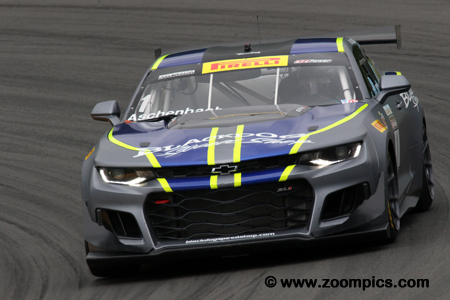 Five-time Pirelli World Challenge champion, Lawson Aschenbach entered the finale fifth in the overall standings – not bad considering he failed to score points in fourth races. However, in the Sprint category, Aschenbach was second with a chance of catching the leader, James Sofronas. In both of the weekend’s events, he started and finished third which was not enough to catch Sofronas for the Sprint title. The only KTM X-bow in the series was driven by newcomer, Nicolai Elghanayan. Elghanayan failed to score any points at the first event he entered – Circuit of the Americas. However, at Lime Rock Park, he won overall and the following day was third in the amateur category. 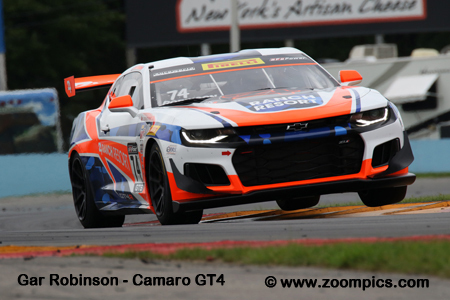 Elghanayan was back on form at Watkins Glen International, in the first event of the weekend, he finished second in GTSA and on Sunday was fifth in class. 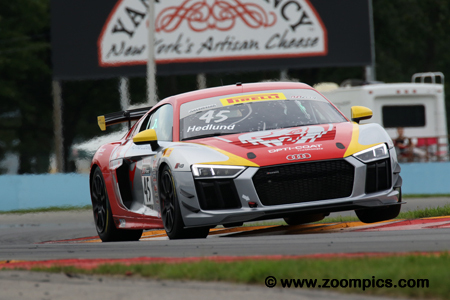 The Flying Lizards team entered two Audi R8 LMS GT4s in the finale at Watkins Glen International. The No. 45 Audi was driven by Mike Hedlund. During 2018, Hedlund focused on the GTSA Sprint category. To date, his best result was a runner-up finish in round six at Road America. 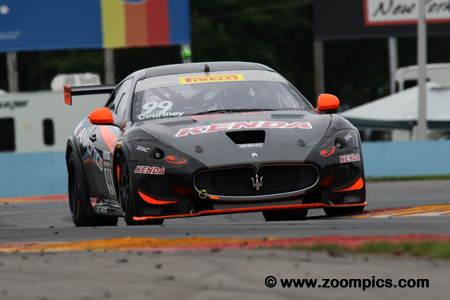 In the weekend’s first race at Watkins Glen, he started second in GTSA but finished twelfth. In the finale, Hedlund grabbed the win. James Sofronas and his driving partner, Alex Welch won the GTS SprintX title at the Utah Motorsports Campus. 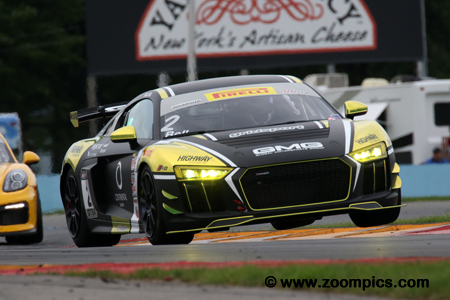 Entering Watkins Glen International, Sofronas was leading the Sprint and overall title chases. With a comfortable lead in both categories, all the driver of the No. 14 GMG Motorsports Audi R8 LMS GT4 had to do was finish the races and score some points. Sofronas was successful and won all three GTS championships. In 2018, Tony Gaples reached a milestone when he started his 200th Pirelli World Challenge event at Utah. The driver of the No. 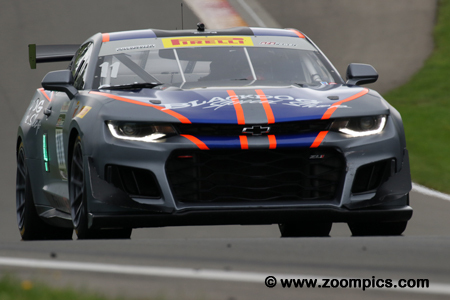 11 Chevrolet Camaro GT4 entered Watkins Glen tied for third in the GTSA category. In Saturday’s race, Gaples started seventh in class but was able to finish third. The following day, he could only manage a sixth in GTSA; however, the result allowed him to finish third in the final class standings. Another driver competing with the championship-winning GMG Racing team was GTSA driver, Jason Bell. Bell was gridded seventeenth overall and ninth in class for the weekend’s first contest but moved up during the race and was seventh in GTSA at the checkered flag. In the final race of the season, he started fifth in his group. Passes on Nicolai Elghanayan and Orey Fidani allowed, Bell to capture third place. GTSA class driver, Drew Staveley gave notice in round one at Saint Petersburg that he would be a contender for the championship. In the season’s first race, he was first in class and third overall. 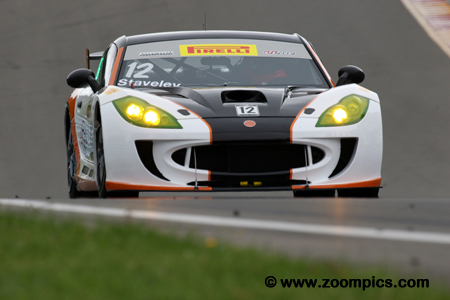 Staveley went on to score three class wins and took the GTSA SprintX title. In the penultimate round, he was only able to finish tenth in class. He fell short of taking the GTSA Sprint championship by twenty-two points.